The Riddler is a Batman villain who made his first appearance back in 1948. He always sets Batman riddles to solve as clues before committing his crimes. 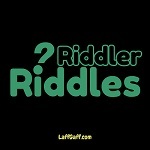 Here are the best Riddler riddles he's set over the years. How many can you solve? What is the beginning of eternity, the end of time and space, the beginning of every end and the end of every race? Why is an orange like a bell? Because they both need to be peeled. What is always on its way here, but never arrives? What won't run long without winding? What belongs to you, but is used by others? We're five little items of an everyday sort; you'll find us all in 'a tennis court'. Why is a woman in love like a welder? They both carry a torch. When is the time of a clock like the whistle of a train? When it's two to two. What has branches and leaves and no bark? How many sides has a circle? Two. The inside and the outside. What is it that no man wants to have but no man wants to lose? The more you take away from it the larger it grows, what is it? Which president wears the largest hat? The one with the biggest head. There are three men in a boat with four cigarettes but no matches. How do they manage to smoke? They threw a cigarette overboard, and made the boat a cigarette lighter. When is a person like a piece of wood? What goes up white and comes down yellow and white? What is it that travels on all fours in the morning, on two legs at noon, and three at twilight? What people are always in a hurry? What is Joan of Arc made of? When is a prizefight like a beautiful lady? Why is silk like grass? They are both sold by the yard. What do you throw away that keeps returning? What has neither nails or bones, but has four fingers and a thumb? What kind of pins are used in soup? Why is a musician's bandstand like an oven? Because that's where he makes his bread. When is the top of a mountain like a saving's account? When it peaks one's interest. When does a painter use a trigger instead of a brush? When he's a stick up artist.